A simple and fast way to measure opinion on an issue is to conduct SMS-based polls. SMS polls enable your callers to respond to a structured question via an SMS response. As the SMSs arrive on the Freedom Fone system the individual SMSs are tallied and a summarized tabular output is generated. In scenarios which need urgent action but yet rely heavily on evidence-based information to take the first step, SMS polls can be a powerful and effective tool. 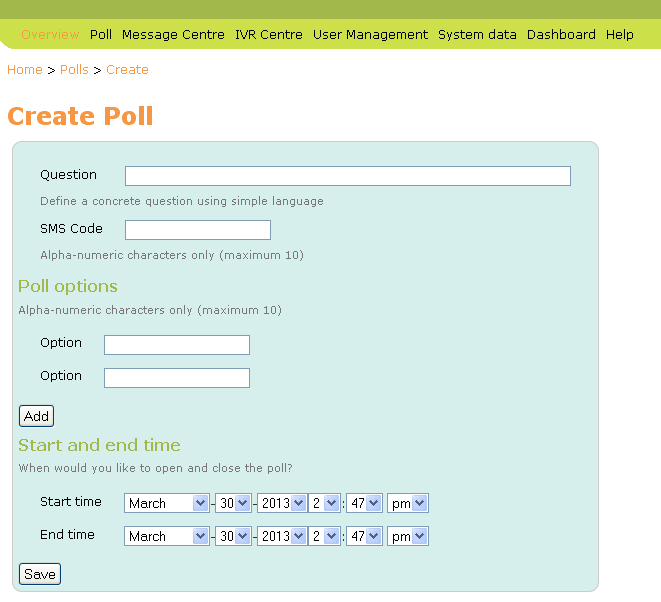 The Poll function allows end users to participate in polls by sending a SMS to Freedom Fone. The Poll functionality allows for time sensitivity, providing a start and end date/time, and multiple choices for a user to select from. The polls are available at Poll > Manage Polls. Poll details can be communicated with the public via any means, including website, email, radio and printed materials. Remember to share the above details and include the poll code and the phone number to which participants should send their SMS replies. You can refer to the chapter about advertising your service to get some ideas on how to spread the word out about your poll. For each poll, once it has started, the administrator can at anytime, view the interim or final result in terms of number of votes per answer, and percentage of total votes per answer. Received before the poll opened. Received while the poll was open. Received after the poll was closed. Early votes will be registered as “Valid, early”. The number of early votes per poll option is presented in a separate column under the View poll page. Early votes will not be added to the Total votes accepted for the poll. Late votes will be registered as “Valid, late”. The number of late votes per poll option is presented in a separate column under the View poll page. Late votes will not be added to the Total votes accepted for the poll. The Early and Late vote classifications are summarised separately to provide a complete view of votes submitted to the poll concerned. Invalid votes are registered as votes, but classified as “invalid”. “Early”, “late” and “on-time” invalid votes are also registered. Only “on-time” invalid votes are incorporated into the Total number of votes summary. Invalid vote totals are provided to give you an idea of how SMS errors might impact on poll results. Incorrect votes have a non-matching poll code. Incorrect votes that cannot be matched to any existing poll, will be classified as an incoming SMS and will be stored under “Other SMS”. The SMS will be classified as “Unclassified”. The poll is not sensitive to casing, so 'yes' ,'Yes', 'YES', 'yEs' will all be interpreted as a YES. The same logic applies to the poll code. More than one poll can be active at the same time. Incoming SMS are identified by the code used and matched with existing polls. The timestamp used to determine whether or not a vote is in time for a poll, is the time of arrival to the Freedom Fone platform. Hence, if an SMS gets delayed in the GSM network, it will be classified as late even if it was sent before the poll deadline. The question you want your audience to answer. The poll code. It cannot comprise more than 10 alphanumeric characters. This code must be included as the first word in an SMS vote participating in the poll. Two or more answers to the question. For example the question might be "Does your family make use of mosquito nets?" Your valid answers would then be "Yes", "No" or "Sometimes". Date and time when the poll opens for submission. Date and time when the poll closes for submission. Question: Would you like to deploy Freedom Fone in your organization? The administrator can at any time edit the above listed fields. Of course, it is not recommended to change the question, code or answers to a poll once it has been opened to the public. Before a poll is opened, and after it has been closed, no poll votes are registered for the poll.